WOLFPACK CHINA! 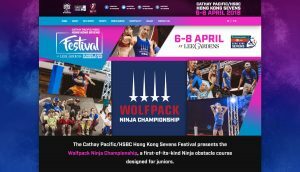 – Our Hong Kong Youth Ninja Racing Competition was a HUGE SUCCESS! Below are some more of the recent previous Ninja events & important dates for competitions, school talks, and Ninja live appearances! February 25th – Ian Dory & Dr. Kaufman gave a Rotary Club Fort Collins presentation on our mission and how to get kids healthy in the U.S.
April 7th – BOY SCOUT FUNDRAISER: Brian, Ian & Noah represented Wolfpack Ninjas at the Boy Scout Breakfast! April 23rd – Fort Collins EARTH DAY – Wolfpack Ninjas spoke and ran little Ninja Cubs through obstacles! Signing merchandise and teaching about health and what we can do for the EARTH! April 27th & 28th – Wolfpack Ninjas competed in American Ninja Warrior 8 in Indianapolis, IN! Come cheer us on! Televised this coming summer on NBC Television. Wear your Wolfpack Ninjas shirts and hoodies and come out and support your team! May 6th – EMS Fundraiser for UC Health. May 14th – Fort Collins WOLFPACK NINJA TOUR YOUTH COMPETITION! Wolfpack Ninjas meet & greet and youth competed for great prizes from sponsors! Amazing Ninja Obstacles for kids! in Fort Collins, CO.
May 25th – Dr. Kaufman and wolves presented a Lunch seminar to a Rotary club in Denver, CO about the Wolfpack Ninjas mission and goals for national health initiatives. June 1st – Dr. Kaufman and wolves presented a Lunch seminar to a Rotary club in Fort Collins, CO about the Wolfpack Ninjas mission and goals for national health initiatives. June 15th to 22nd – American Ninja Warrior FINALS in LAS VEGAS, NV! Start planning now! Make the summer trip to Vegas to support your Pack! We would love to see you and need your help to conquer the course AGAIN this year! AWOOOO! July 3rd – Longmont NINJA INVITATIONAL COMPETITION! Pros compete for prizes and YOUTH tested their skills during the day on an AMAZING FULL Ninja obstacle course! August 20th – Fort Collins, CO was PEACH FEST Obstacles for kids, health and motivational talks and time with Wolfpack Ninjas! Ian Dory’s team “MiDORYama” dominated and advance to the Semi Finals! Meagan Martin was super strong as usual and Dan Yager, a close friend of the Wolfpack Ninjas (and basically one of us!) also looked really fast! Ninjadoc’s team, The Think Tank was on FEBRUARY 9th on ESQUIRE TV. Dr. Matt Wilder and Asya Gretchka are Noah’s team mates! Here is Ian and Meagan’s team winning the first episode, Aroooo!